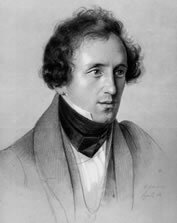 After an interval of more than three years, The Mendelssohn Project resumed its popular series of Salon Concerts on June 2, 2009 at The Century Club in Manhattan, by holding its eighth such event. As before, the music combined a world premiere with well-known and beloved music. To start the evening off, world-renowned pianists, Misha Dichter and Cipa Dichter played three songs from the unpublished Seven Songs Without Words for Piano 4-Hands, which had been dedicated to Queen Victoria and Prince Albert in 1844. The Dichters' performance, using an edition commissioned from The Mendelssohn Project, was a preview of their world premiere performance to be given at the Ravinia Festival on June 20, 2009, and to be repeated two months later at the Aspen Music Festival on August 20. For more information on their upcoming concerts of this Mendelssohn masterpiece, please click here. Following brief introductory remarks by Stephen Somary, Artistic Director of The Mendelssohn Project, and by its Executive Director, Dr. Antonio Baldassarre, pianist Orion Weiss, violinist Adrian Kontaya, and cellist Konstantin Manaev from Zurich's Kurt Leimer Piano Trio, combined forces to perform Felix Mendelssohn's most beloved chamber music work: his Trio in D Minor for Piano and Strings, Op. 49. Our specially invited guests, as well as all of us at The Mendelssohn Project, were swept away by the beauty of the extraordinary music by our 19th-Century namesake. Please enjoy looking at a few pictures below from the reception which followed the performance; and if you would like to be notified about future events, as well as to receive breaking news on our work, and on the Mendelssohn field in general, please click here to sign up for our mailing list. Pianists Misha and Cipa Dichter to Premiere Felix Mendelssohn's "Seven Songs Without Words"